With how much fun our son had with his kids indoor castle tent, I thought we would put together an extensive list of the best kids indoor play tents. There are literally thousands of different options that you could pick from as a parent – so we went out there and did the research for you! After looking at numerous reviews, prices, the quality of materials, and how cool they look – we put together our list of the best options! These options aren’t in any particular order, but hopefully this list helps you find the perfect tent that will encourage lots of imaginative playtime fun! We Have updated this for 2017! Please enjoy our updated list of the Best Indoor Play Tents for kids. 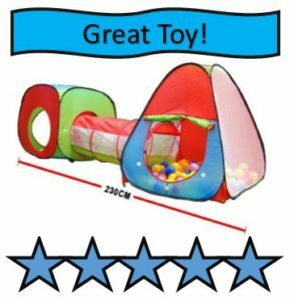 #1 Roadacc 3 in 1 Children’s Playground Tent Set – This tent is awesome because it is one larger triangle tent that is connected by a tunnel to a smaller square tent. It is an easy fold and pop-up design – with a steel framing system that makes it super durable. Each tent can be setup by itself, or all three tents can be setup at the same time. 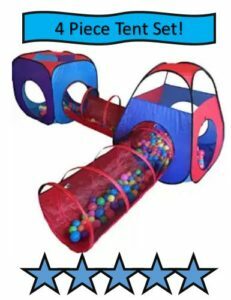 It is a lot of fun to put balls into the tunnel or tents and let your kids go wild! #2 Superior Imagination Children’s Indoor Circus Tent – This is a really fun, colorful tent option. It is built with the classic circus color style with lots of red, blue, and yellow. Poles are concealed and very durable. There is one big door that opens and closes (closes loosely) and can be velcroed (that is a word right?) open. It has a diameter of about 39 inches and a height of 48 inches and is perfect for any colorful children’s room! #3 Truedays Kid Big Tent Playhouse – This a great children’s indoor play tent because of its size. It is a 55” x 47” x 47” play space that is perfect for multiple children to play in simultaneously. The color scheme is nice with lots of red, blue, yellow, and white incorporated throughout the design. It is shaped like a home, and has some big windows that allow for good air flow. We highly recommend this tent for anyone needing a play tent for multiple children. #4 Kiddey Kids Pop Up Play Tent- This is a very good and inexpensive option for a one child, smaller sized play tent. It is triangular shape, with lots of colorful polka dots on the outside of it. The shape allows it to easily be folded up and stored. It does have a floor (some of these tents do not) so it can be used for small outdoor play experiences. With a big mesh window, it has good airflow, but also makes it easy for parents to see what is going on inside. 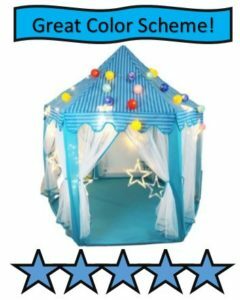 #5 Pacific Play Galaxy Dome Tent w/ Glow in the Dark Stars – I love, love, love this tent for any child that has an interest in space! It is black in color with lots of multicolored stars and planets incorporated into the design. The galaxy graphics are glow in the dark, adding even more fun for your child. The setup is pretty simple with durable color coded poles, and the size of 48” x 48” x 42” provides enough space for multiple young children. You could easily incorporate this play tent into any space themed bedroom! #6 POCO DIVO Fire Engine Truck Pop Up Tent – This is a little different that your traditional tent because it doesn’t have a top. It is designed to be just like a fire truck where your child opens the door on the side and can pretend to drive the truck around! It looks great, with the classic red fire truck color and all sorts of little details incorporated into it. It is a pop up tent – so there are no poles and the setup is super easy. Any kid that is into fire trucks would love this! #7 Kiddey Knight’s Castle Play Tent – This is similar to the castle tent that we purchased for our son. It is the classic stone castle design that encourages lots of imaginative play. There are a couple of side windows for viewing and airflow, and a big roll up front door. There are four poles that hold the tent together and setup should only take a few minutes. The big selling point here is the castle design, what kid doesn’t love pretending to be a princess, prince, king, or knight! same tent as the above listed knight’s castle tent, except it is pink in color. This one is designed for girls I guess, but I’m big into letting boys or girls pick whatever color tent they want to play in. This one is a nice pink choice! 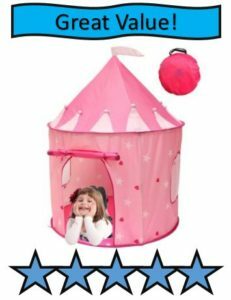 #9 Playz Designer Princess Castle Play Tent w/ Tunnel – There is some good and bad with this tent. The tent itself is great looking, very pink in color with a neat forest/fairy tale theme incorporated into the design. It also comes with a neat tunnel that is great for putting balls into. A mix-up in design does not allow for the tunnel to connect to the tent, right now you would have to put into the front door. Playz has apologized for this and is planning for the September 2016 edition to have a space where the tunnel will connect into the tent. Once this mix-up is corrected, it will be even better! #10 Glamore Mushroom Shaped Indoor Play Tent – For parents that are looking for something completely different than what most kids have, why not pick a mushroom shaped indoor play tent! The size is relatively small, so it is meant for 1 or 2 kids, but it is cute. It has a big red mushroom top that is detachable. It has a couple of mesh windows, and Velcro flowers on the outside that can be attached and reattached. This is a fun, imaginative tent that is a real unique option! 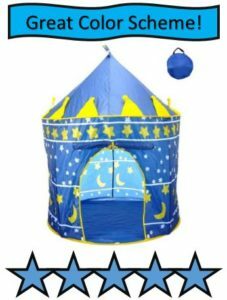 fan of the blue color this tent has, and the yellow moons and stars really add a nice pop to the design. The design is not the most durable when compared to some of these other options – so you may want to pick a different option if your child is high energy and high spirited! It even comes with a travel bag in case you need to take it lots of different places! 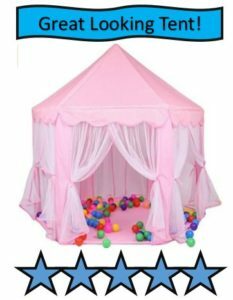 #12 Unicorn 3-In-1 Pink and Blue Kids Play Tent – This is another option that has two separate tents that are connected by a tunnel! The set includes all three tents. All three can be setup at once, or you could use just one tent, or the tunnel and a tent. The setup is quick and you do have a storage bag to pack away any unused tents away. The bright blue and pink color scheme really pops, and the manufacture even has a 30 day money back guarantee – which you probably won’t even need due to the great reviews this tent has gotten. #13 Creatov Children’s Pink Castle Play Tent – The durability of this play tent is very good. They call it a castle tent, which is a little misleading since it isn’t designed to look like a castle. It does have crowns, and some pendants, and dots on it, but doesn’t have the stone design I would expect from a castle tent. Still, it is a very good stereotypical pink princess play tent. are going to buy a pink princess play tent – this is my top choice based on looks alone. When they say pink them mean pink, and it has lots of lacy curtains that can be tied open. It is also huge with a 55 inch diameter and a 53 inch center height. It has a pop up design that makes it very easy to setup and take down, and a zipper carry bag that makes it easy to store. #15 BATTOP Children Play Tent Playhouse – This is a really good, smaller sized house looking tent. It is 34 x 34 x 44 inches in size, and has a unique red, blue, and yellow color scheme that kids are going to love. There are two large doors and mesh windows, and the overall look is sharp. The smaller size does make it a tight fit for 3 or 4 toddlers, but is perfect for teaching independent play for 1 or 2 children. 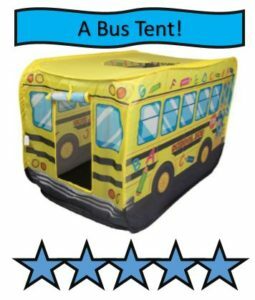 #16 Clever Creations School Bus Play Tent – I love tents that are designed to represent something kid’s love, and this one is shaped like a school bus! The back door opens so kids can crawl into it, and there is an opening on top that kids can stick their heads out of. It looks like a bus, and any child that loves school buses will love this tent. It also has a manufacturer’s guarantee where they offer a full refund or replacement for the first year of ownership! That is someone that is confident in their product. #17 Truedays 3 in 1 Green Adventure Play Tent Set – This is another very good 3 tent in 1 set. The tunnel connects a big open play pen to a cabin shaped tent. The open play area is perfect for balls, trucks, toys, or whatever your kid enjoys playing with. The tunnel is a great hiding spot, and kids really love tunnels for some reason. The cabin shaped tent has plenty of openings. Green is the main color here, so if your child likes green, this is a good pick. This set is pretty large, so it make take up an entire playroom. #18 Pacific Play Club House Tent – Pacific Play makes some really awesome looking tents, and this is no exception. This tent is designed to looks like an old log cabin, and even has awesome details incorporated into it like a little beaver, owl, and a private sign over the front door. It is 50” x 40” x 50” so it provides a lot of space for older children, easily fitting 3 more kids depending on ages. There are mesh top panels, roll-up flaps, but really it is the look of this tent that separates it from most other options. TIENO calls this a princess castle, probably because of the lacy looking flaps that open up, but the light blue color scheme is a nice changes of pace for predictable pink princess castles. The hexagonal shape makes it very stable, and the 55” x 53” play space will provide plenty of room for your kids! #20 GreEco Kids Pop Up Play House – This is another large house shaped tent that provides a play space of 4 feet x 3.5 feet x 3.5 feet. The spring frame allows it to pop right up when you are ready to set it up. There are two color schemes to pick from pink and blue and it has a mesh roof that easily lets parents spy on children that are playing inside. It is a good price for a nice tent! 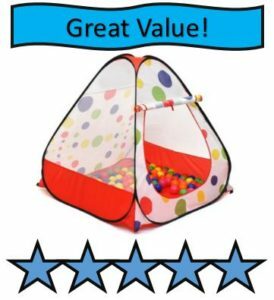 #21 Kiddey Circus Pop Up Play Tent – This is a great classic circus big top tent! Bright reds, yellows, and blues make up the majority of the color scheme. It has nice size, and it does come with 4 ground stakes, so you can use this tent outside and eliminate the threat of it blowing away with the wind. #22 Aweoods Teepee Play Tent – This tent reminds me of my childhood when kids were always playing cowboys and Indians. It has a classic teepee look to it, with Native American art elements on the outside of it. It opens up to a space of 41 inches by 41 inches by 63 inches, making it nice and tall. It is sized properly for one or two children. There are a lot of different teepee style play tents, this would be one of the most traditional looking ones. 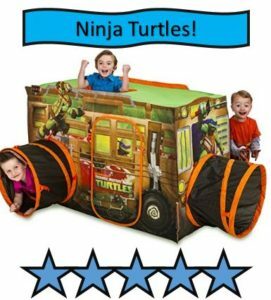 #23 Playhut Teenage Mutant Ninja Turtle Shell Raiser Vehicle Tent – This is another flashback to my childhood with Teenage Mutant Ninja Turtles being popular again. This should be high up on any list for kids that love Ninja Turtles, and the tent itself is awesome. You have an opening on top, multiple tunnel holes you can crawl through (it does not come with tunnels), and the graphics are designed really well. Size is excellent, being 52 x 54.5 x 34 inches, giving you plenty of room for three or four younger kids! The tent does not have a bottom, so do keep that in mind if you decide to purchase it. #24 KINGDO Pop-Up Car Play Tent – This tent is really good for one child, maybe two young toddlers that love to pretend they are driving around in cars. The size is relatively small, being 50 inches in length, 26 inches in width, and 26 inches in height. The color scheme is fun and the pop tent only requires a couple of poles to stay upright, making setup especially easy. Again, this is a great option for a young toddler. 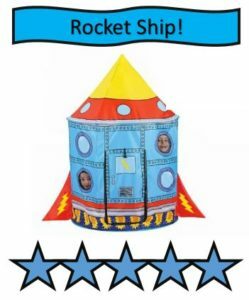 #25 Liteaid Rocket Ship Tent – This is a really fun rocket ship tent, with a light blue color scheme accented by reds and yellows. This tent should encourage any child that loves space to have imaginative adventures, especially if your child watches a lot of Mickey Mouse Clubhouse (my child loves those space adventures Mickey goes on). Size wise you are looking at 35 inches by 35 inches by 54 inches. The most underrated feature is the little windows that let your kids poke their faces out of. #26 KidKraft Pink Teepee Tent – This is a very durable tent that actually has a bamboo frame, and a great pink patterned canvas. The dimensions are 42.9 x 42.9 x 69.3 providing plenty of play space. It is recommended for children ages 3 and up. It is also recommended only for indoor use, some of these tents can be used outside sparingly, we would not recommend that for this one. This tent is also made is a really cool turquoise color, and an orange color! Great choice if you are looking for a teepee style tent instead of a castle, square tent, or playhouse. #27 Mallya Pirate Ship Play Tent – This tent is fun with a boat frame, a rectangle cabin area, with basically 2 red sails/flags. This will be a fun tent for any child that enjoys playing pirates, and the size is large enough for a couple of kids. It is 47” long, 28” deep, and 42” tall. This is one of the more difficult tents to setup, lots and lots of poles, but it shouldn’t take you too long. 3 piece set, why not buy a 4 piece set! This one comes with two tunnels that connect a triangle and square shaped tent. The triangle tent is a little bit taller, allowing for plenty of stand up room – and the triangle tent has plenty of mesh opening you can look out of. The fabric is soft and durable, and you should really enjoy this tent indoors or outdoors. #29 Tinytoy Kids Big Play Pop Up Play Tent – This large tent comes in a sharp looking pink and purple color scheme, with lots of doors and windows. It has your standard playhouse look/design, but the size is great. It is 55” x 47” x 47” which is great for multiple boys and girls to play inside. The floor is water proof, which does allow it to be used outdoors is you want too, and the polyester materials are easy to clean with soap and water. It is very affordably prices for its size. 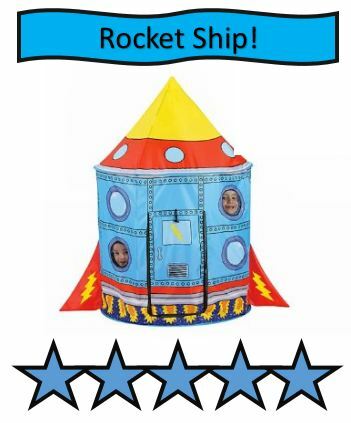 #30 Imagination Generation Space Adventure Roaring Rocket Tent – This is a really fun space ship tent with a silver color, a red top, and big blue USA letters on the side! It is just under 5 feet tall, so two astronauts could fit in there comfortably (pretend astronauts – real astronauts might be a tight fit). Sometimes the little details are what make these tents awesome, and this one even comes with a Milky Way galaxy storage bag with planets and the sun on it. This is just a really solid space and rocket ship tent that kids will have a lot of fun with. 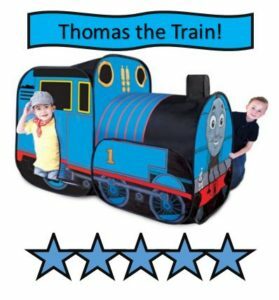 #31 PlayHut Thomas the Train Tent – There are many parents that have seen their kids become addicted to Thomas the Train, and if your child has fallen into that cult of kids – you might want to think about purchasing this play tent. It has the Thomas the Train look we all recognize, it is a twist tent that pop ups. The size is pretty good, being 38” x 52” x 26” – which should fit one, maybe two conductors comfortably. There is also an opening where a tunnel can be connected to it. It is just a great fit for any Thomas fan! #32 Eggsnow Kids Folding Space Castle – I guess this is called a space castle because it is round and has a pointy top on it – I say that because I’m not sure what a space castle looks like. Regardless, this tent looks good, with a really nice dark space blue color, with rocket ships and planets on it. It has two windows and a big door that opens up – with plenty of space for children. #33 Giga Tent Fantasy Palace Play Tent – This is one of the more unique play tents you can purchase. The shape is really cool with being long and rectangular, with two red triangle tops. The unique shape does allow for a bigger play space – so 3 or 4 children will have no problem playing in it. The unique look also allows for some great imaginative play, and this tent is good for slightly older children too. #34 Clever Creations Kids Fire Station Play Tent – This is a fun tent that is designed to be shaped like a fire station, which multiple fire truck graphics on the tent. It does not have a floor, and the frame is made from plastic support tubes that snap together. Setup should only take a few minutes, and the size is 37” x 27” x 40.5”. This is a really good all-around tent for children! 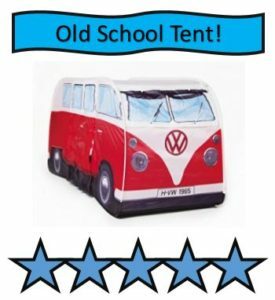 #35 The Monster Factory VW Volkswagon Pop Up Play Tent – This tent seems more geared towards parents who love old school VW hippie vans – and want to pass on that love to their children. This tent looks like an old school Volkswagon van, and the rectangle shape fits children just fine. There are lots of really good color schemes to pick from – including blue, yellow, orange, red, and pink. Children that love cars, trucks, and things of that nature should enjoy this tent a lot. Size wise, you are looking at 65 inches x 21 inches x 30.5 inches. #36 Pacific Play Tents Lady Bug Tent w/ Tunnel – This is a really fun tent because it is shaped like a traditional tent, only red in color with black dots (hence the lady bug theme) and it also has the ladybug color scheme tunnel connected to it. This tent is just fun. It is well designed, vibrant in color, and will be fun for indoor and outdoor playtime. It is a great option to pick from. #37 Pacific Play Giant Teepee Tent – Unlike the KidKraft Teepee tent, this one does not have a bamboo frame that hold everything together. It is free standing, and has a 5 foot by 5 foot base area, and is over 8 feet tall! Plenty of space for lots of kids – just make sure you have enough room in your house to fit it! It has a nice orange and brown color scheme, with a really big front opening that makes it easy to get in and out of. #38 Dimple Underwater Themed Pop Up Play Tent – This is a unique and creative tent. It is large and square in shape, but has a really slick underwater design to it. It has really cool colored stripes that go across it in yellow, blue, and red. There are also swimming fish, including clown fish, on the outside of it. It is an instant pop up tent, so if your child is very active and running full speed into the sides of it, chances are it will fall down on them, but that is no big deal! #39 Jooyi Kids Indoor/Outdoor Big Zebra Design House Tent – This is truly a tent designed for parents that want to get their kids something different from everybody else. What makes it cool is the standard tent shape, with what looks like a giant zebra coming out of the top of it. Of course it also has the standard black and white striped scheme we would expect out of a zebra tent. It should be lots of fun, but is truly unique. #40 Alvantor Kids Playhouse Tent – This is a fun tent for young kids, but older toddlers will grow out of the design quickly. It has a fun “critter camp” design to it with bears, and rabbits, raccoons, birds – you know all the good outdoor critters. Kid’s that love animals will love playing inside this tent, and the size is large enough to hold multiple children. There are a few other themed tents out there, but this list includes many of the best options for your children. If you were looking for something different, like outdoor camping tents for kids, you should read this article from Amazing Outdoor Adventures about the best Outdoor Kid’s Camping Tents.